Henderson argued for the sale of Opel; GM's board disagreed. 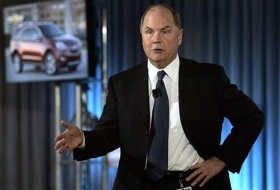 DETROIT - - General Motors Co. still plans to repay roughly $8 billion in debt to the United States and Canada by the end of June, said Ed Whitacre, chairman and interim CEO. "We intend to pay the debt," Whitacre said today. "We'll be finished by June." His comments about repayments related to GM's government-sponsored restructuring echo plans revealed by former CEO Fritz Henderson last month, when GM posted a $1.15 billion loss for the July 10 to Sept. 30 period. GM emerged from bankruptcy on July 10 as a new company majority-owned by the U.S. government, and the $8 billion debt doesn't include federal loans converted to equity. Whitacre, who became acting chief executive two weeks ago when the board split with Henderson, said he was not sure how long he would serve as the automaker's top executive. "I'm enjoying it," Whitacre told reporters when asked about his new role. Whitacre said he did not intend to stay for long as CEO, but had not set a time for stepping aside with GM's 12-member board. "Do I want to do it long term? I told the board no, but I haven't defined that. I can't even define that myself," Whitacre said. Whitacre said GM's board differed with Henderson on whether the automaker should sell its European Opel unit, but a range of considerations had led directors to conclude it was time for new leadership. Henderson became CEO in March when his predecessor, Rick Wagoner, was ousted by the Obama administration. "I think the board wanted to change things, do things a little differently, go in a different direction," Whitacre said. On Opel, while Henderson argued for a sale, the board had favored keeping the unit, a position it announced in a reversal of its previous stance at a meeting of directors in early November. GM had been widely expected to complete a sale of Opel backed by the German government to a Russian-backed group led by Canadian auto-parts supplier Magna International Inc.
"The board disagreed with Fritz on Opel. I don't think that's any secret," Whitacre said. "The board looked at it and said, ‘This is a valuable asset. Why should we sell it for something that probably wasn't enough money when we can do something with it?' We just disagreed and the board wanted to have Opel." In another break with the turnaround strategy advanced by Henderson, Whitacre said he had no timetable for a relisting of GM shares through an initial public offering. Henderson had said an IPO would be possible as early as the second half of 2010. "We don't have a specific time frame for an IPO,'' he added. “We have some things we have to do internally. We have to produce results."